I need to get some things out of the way. First things first - I’m a huge Fighting Fantasy fan. I’ve been reading them since 1983 and it was the game that got me into the tabletop gaming hobby. 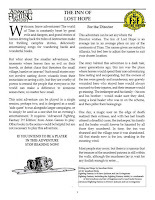 I got myself wrapped up in the worlds of Fighting Fantasy, especially Titan, and I played the books, the RPG, the boardgames and the computer games. I was first in line at the UK Games Expo a few years ago to get my 25th Anniversary book signed by Jackson and Livingstone, and I can quite easily attribute my love of fantasy gaming to the exposure I had to these books. I’ve also got a mention in the actual book itself, which warms my heart on so many levels I can’t even begin to explain it. Telling you all that will probably cast a bit of a shadow over this review as I’m hardly going to be subjective, am I? Look at it this way; I’m not writing this review as a critic, but as a passionate fan of not only the subject but the genre in general. 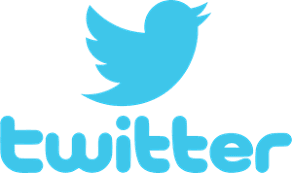 The chances are you’re reading this because you have an interest, perhaps even a love, of gaming. In that case, let me share with you my excitement in reading this book. 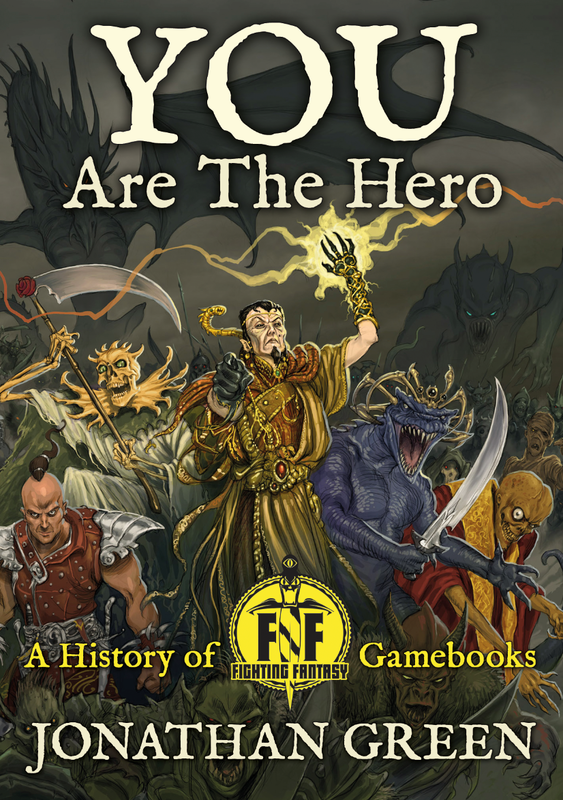 You Are The Hero has been researched, compiled and written by author Jonathan Green, himself a veteran of Fighting Fantasy as both a fan of the books and as a writer for the official line. Inside the lavishly illustrated full colour book you’ll find pretty much everything you need to know about Fighting Fantasy gamebooks, from Steve Jackson and Ian Livingstone starting out in Games Workshop in the 1970s, to the first books and how they got them on the shelves, to the artwork, other writers and the different worlds they created, to the RPG and where Fighting Fantasy is today. All the way through we’re treated to images, artwork and snippets of interesting information in the little Fighting Fantasy Facts (I’m in number 27!). As far as presentation goes it’s a great looking book, and the interior full-page colour panels of the book covers are quite beautiful, especially as they’re just the images with none of the original text covering it. All in all the entire book oozes flavour. The images evoke a sense of atmosphere and - for me and no doubt other older fans of the series - a sense of misty-eyed nostalgia. It really threw me back to the heady days of fandom when I was in my teens and all of this was new and exciting. Newcomers to the hobby or those reading this book out of pure curiosity will find it all quite informative as the illustrations take the reader through the years and decades. The story that the book tells is, of course, the meat of the product. From Jackson and Livingstone’s early days up to the present day and the involvement they still have with the Fighting Fantasy world we’re taken step by step through their own histories, their meeting, their early hobby and Games Workshop day and then the books themselves and how the got them off the page and into the stores. Much of this was covered in talks I attended at the UK Games Expo but if you think they addressed everything in their seminars then think again – there’s plenty of stuff in here that I didn’t know and getting to hear the story of the first books from the publishers, artists and writers gives you a whole new appreciation of how these books made it into the eager hands of children such as myself. All the way through you get details on the books of the original series. With information about the book’s plot, little quotes from the writers and artist and snippets of information these make for good reading and cast new light on the books and the people who helped create them. There’s plenty of stuff in here covering every aspect of the Fighting Fantasy franchise; the books, miniatures, boardgames, battlegames, RPGs, computer games and magazines. This information leads on to details about other gaming books and lines, such as the Sorcery! epic, Clash of the Princes and the novels, as well as other lines such as the Tasks of Tantalon and the Way of the Tiger series, even the old F.I.S.T computerdial telephone game (which got me into plenty of trouble over phone bills). Everything Fighting Fantasy touched and influenced gets a mention and there are plenty of people interviewed, and they all talk about how they became involved or how the books influenced them. Fighting Fantasy gets a lot of love and it’s quite wonderful to see the positive power the gamebooks had on the public and on professionals who were either in the business, about to break into it or were inspired to get involved. The whole tome gives me plenty of pleasure from beginning to end. There were more than a few ‘Oh, yeah! I remember that!’ moments and plenty of material that makes me look at my Fighting Fantasy collection and want to add more to it. It’s also made me revisit the world of Titan and ponder running an original roleplaying campaign using the original basic rules from the 1980s. More than anything, it’s made me wonder at the future of Fighting Fantasy and how it can be relaunched into the national consciousness. I’ve thought of everything from new computer games to radio dramas to children’s TV; although it was the books that fired the imagination of a generation in the 1980s and 90s, this is a new age of technology and multimedia. The books are still relevant but there has to be a new hook, a gateway, to get the young people of today reading them again. You Are The Hero takes me back to the days of old when the books were new and exciting but it also really makes me want them to be successful again, so that this generation can explore and enjoy the worlds of Fighting Fantasy. An excellent read that takes old gamers like me back in time, as well as being an incredibly interesting history lesson in the early days of gamebooks and British gaming for the regular hobbyist to enjoy. Highly recommended. I have only ever read one other book by Andreas Eschbach and that was his incredible science fiction epic ‘The Carpet Makers’. That book has a special meaning for me as it came along at a special time in my life. My son had just been born and during his first two weeks in this world I needed something to do between the regular feeding and cleaning. I had purchased The Carpet Makers many moons beforehand and now was the time to read it. While my son slept and my wife and I watched over him, I would read the book and get lost in the amazing universe of small people and huge empires. The book made a huge impression on me at an important time in my life and it is one book that I am incredibly attached to. It’s been many years since I read The Carpet Makers. Sadly, I could not find any other Andreas Eschbach books because his work had not been translated into English. That is, not until I was handed an ebook copy of his newest novel, ‘One Trillion Dollars’. ‘John Fontanelli is paid a visit by the Vacchis, a family of Italian lawyers, who have some startling news. He is to inherit a fortune, which started as a three hundred florin investment in the sixteenth century by his ancestor Giacomo Fontanelli, but through the magic of compound interest has grown into a trillion dollars – and is still growing! In one fell swoop, John has become by far the richest person in the world, his net worth being bigger than the GDP of most countries. There’s no long-winded introduction of the protagonist John Fontanelli – you get to know him through some snapshots of his miserable job, his broken relationships and his uncertain future. At first I thought that I would have liked to have a bit more background on him but Eschbach wastes no time in getting to the meat of the story. It’s then you realise that the caricature of Fontanelli is there so that you have a point of view, so that you can experience what it’s like to be suddenly thrust into a world where you will want for nothing. Although you come to know, and love, John throughout the book I do get the impression that he is initially there so that the reader has a viewpoint on the extraordinary circumstances he finds himself in. Almost straight away you’re asking yourself the question ‘what would I do if I inherited a trillion dollars?’ John helps to address and even question these thoughts in the opening chapters. There’s the period of disbelief, the uncertainty, the sudden bursts of spending. Then there’s the soul searching and, more important than anything else and the driving force behind this novel, what to do with so much wealth. There’s another character in the book, Malcolm McCaine, who comes into John’s life in an underhanded and mysterious way. His character is at first confusing and then incredibly harsh, but it’s very difficult to go into any detail about his role in John’s life, and future, without giving away some serious plot points that work best when unexpected. I’ll just say this; there was more than one moment in the book when I wished I could have reached into the pages and throttled him. Both characters are well realised and have plenty of layers, especially John who you learn more about as the story progresses, so you get to watch his journey and watch him grow at the same time (not always in directions you either expected or wanted). At first I found some of the worldwide and geopolitical business workings somewhat far-fetched and unbelievable, so it was with some shock that when I looked into these things a little further that nearly all of what Eschbach wrote was based on fact. Does the world really work this way? This book has opened my eyes to a few things and has surprised me in many ways and much of that surprise translates into the real world. It’s a bit of a shock to the system. If I had to gripe about two things they would be this. Firstly – and I appreciate that a story such as this positively calls out for it – there’s a lot of exposition in this book. And I mean a lot. The nature of the novel means that crash a course in global politics, social and geographical, and the worldwide economy is in order. Shares, acquisitions, mergers, companies, everything is touched upon or talked about in detail and I found myself having to read certain paragraphs more than once to be sure that I had understood what was being said, and how it pertained to the story. It did feel like certain chapters were nothing but walls of text, and I’m not a fan of exposition in stories, but sadly it’s something that had to be done to make the story work. Secondly, the end was very sudden and, in my view, somewhat whimsical. It didn't ruin or cheapen the book – far from it – but I did feel that after following the journey of the world’s richest man it concluded rather quickly and neatly. The annoying thing is that I can’t explain why without ruining the ending for you. Just be aware that it is one of those endings that people will either love or hate. I lean towards love but I’m not 100% convinced that it’s the way the book should have ended, but it’s a satisfying read overall and it certainly didn't discolour the rest of the novel for me. One Trillion Dollars is an excellent book that will leave you wondering, pondering and thinking about not only the idea of having so much money that you can, quite literally, have anything you want in the world, but also about the roles of government and business and how it affects our everyday lives. It also addresses the state of the world and the future we’re heading into. It works not only as a thought exercise but also as a thriller as it does a good job of making you turn the page to see what happens next. For a novel with no car chases or gunfights that’s an amazing achievement and a testament to Andreas Eschbach’s writing. You just have to know. A great book that’ll keep you pretty much gripped from beginning to end. Highly recommended. One of the difficulties in writing a review of this product is knowing that the game itself has a hugely rich and diverse history. Many tabletop gamers have their favourite edition, they have their most hated edition, they have their favourite parts of certain editions and they have their hopes for future editions. That’s a hell of a mix – one of this game’s many trials is that it’s not enough for Dungeons & Dragons to simply say ‘These are the rules’ when there are a myriad of voices calling ‘But what about our edition, our loves, our preferences?’ Forty years and four editions – not to mention the huge collection of licensed games by other publishers - does that to a game, especially the flagship of the tabletop roleplaying industry. And, love it or hate it, that’s what Dungeons & Dragons is; the industry flagship. The game may not lead the way in the way that it used to but the brand and the strength of it’s history is undeniable. That’s one of the many things, if not the thing, that makes this new edition important. I have a very spotty history with Dungeons & Dragons. I broke into the hobby with the Basic D&D BECMI boxsets and then graduated on to AD&D 2nd Edition, which I simply didn’t like and drifted away from. 3rd Edition and 3.5 passed me by and I came back into the brand with 4th Edition, which I enjoyed at first but soon became a little tired of as it felt too much like a skirmish game that was in contention with the ever growing popularity of MMOs. I backtracked to 3.5 and then Pathfinder, which I enjoyed immensely, and then went back to a more basic form of D&D with 13th Age. After my chequered background with D&D and the fact that I had hit gold with two games that satiated my need for complicated D&D rules and streamlined D&D rules, did I really have to return to the core D&D franchise? Before I continue - yes, I received my copy from Wizards of the Coast and no, I won’t be going into a detailed blow-by-blow account of how this edition differs from the others; this is mainly because that is not how I write my reviews as I’m more interested in how the game makes me feel and what the game does for me as a player, and not what it’s capable of mechanically. Also, comparing this to other editions is pointless as there would be so many points to cover that I’d need more than a couple of thousand words. So, I’ll start with the presentation. It’s a hardback 320 page book with full-colour glossy pages with clear, easy on the eye type. It’s a solid book and it sits open nicely when you need it to, and it’s a good size so you feel like you’re getting your money’s worth. However, the choice of design is the first thing that made me feel that this book might not be for me as I do tend to judge books by their covers, especially gaming books. I need the initial imagery to set my creative mind tingling and in many respects it’s the first draw to get my interest. I reviewed the D&D Starter Set a while ago and I had many problems with the design and, sadly, my opinion hasn’t really changed with this edition. 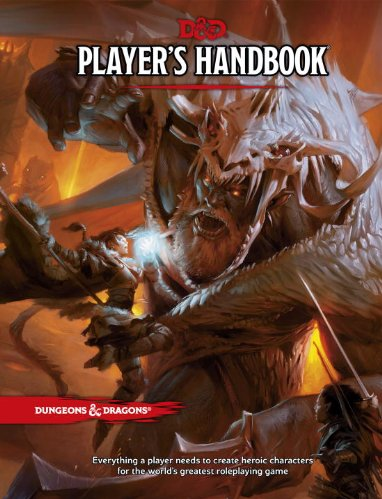 I like the D&D logo but the oversized ‘Player’s Handbook’ and the little red blood splash down the cover with ‘Dungeons & Dragons’ on it just doesn’t really do it for me; it’s a little bland and uninspired. More importantly the choice of front cover image doesn’t really grab me at all; some mage getting in the face of a giant whilst a fighter looks on? It may have been a great image for a supplement or adventure concerning these three but for a D&D core rulebook it doesn’t seem to fit. There’s an image on page 9 that’s simply glorious, with a dragon, a selection of characters and a huge mysterious city in the background. It’s dynamic and inspirational and would have suited the cover in almost every aspect, covering the ideals of the game almost perfectly. The cover art simply doesn’t do it for me and I felt this when I first saw it long ago, hoping that having the physical book in my hands might diminish that viewpoint. Sadly it didn’t and, as good as the artwork is, the cover doesn’t inspire me at all. It’s when you get into the book that you begin to feel the game. The art ranges from excellent to adequate so you’re never really pulled out of the atmosphere the game is trying to create. There’s a sense of reality to the artwork that I never saw in the two previous editions and they appear to have gotten rid of the insane high-fantasy designs of those editions and gone for something a little more reserved. Oh, you’ve still got your crazy armour and costumes in there – it’s fantasy after all - but it feels much more practical and grounded in a form of reality. It’s great art and makes the world tangible. So that brings us on to the meat of the book. After my initial indifference to the cover I was naturally wary of what I’d find inside. I had already expressed my like of the Starter Set rules but the main rulebook was where I’d cast my final verdict over if the game had done it for me or not. Everything you would expect from D&D is there. It’s not that much different from what we have seen before and it’s concisely and clearly laid out. One of my first questions always is ‘Is it new gamer friendly?’ I’d have to say no. There are a few pages of explanations and an example, but nothing that talks you through the hobby. In my case I don’t have a problem with this as I’m game and hobby savvy so I usually skip those parts anyway, but new gamers might need to begin with the Starter Set to get full use out of this book. You’ve got a good selection of Races and Careers to choose from which you can use as designed or for other races you may have in mind. The starting Races are Dwarf, Elf, Halfling, Human, Dragonborn, Gnome, Half-Elf, Half-Orc and Tiefling. The classes are Barbarian, Bard, Cleric, Druid, Fighter, Monk, Paladin, Ranger, Rogue, Sorcerer, Warlock and Wizard. It’s a good choice and you can mix them up with multiclassing in the optional rules if that’s the way you want to go. There’s also Feats in the optional rules and you don’t have to use them but they do add a bit of flavour to the character. In addition, I do I like the little creative flourish to the opening page of each of the Race and Career entries - there’s a neat piece of art with an example character and a background environment to suit the entry, along with some examples of personality and some hints at their relationship with other races. There’s some quotes from some of the D&D novels to add colour, too, such as Salvatore’s ‘The Crystal Shard’ and Weis & Hickman’s ‘Dragons of Autumn Twilight’. It’s a nice touch and somewhat reminds me of the atmosphere of the game from when these particular novels were first published back in the 1980s. It’s all well written and has flavour, that much is sure, but I feel that it reads as if it has been designed for existing D&D campaign worlds, which it most likely has. I used to use D&D for generic fantasy games but with the history and existing settings it’s obvious that they would cater for the worlds that they have already created. 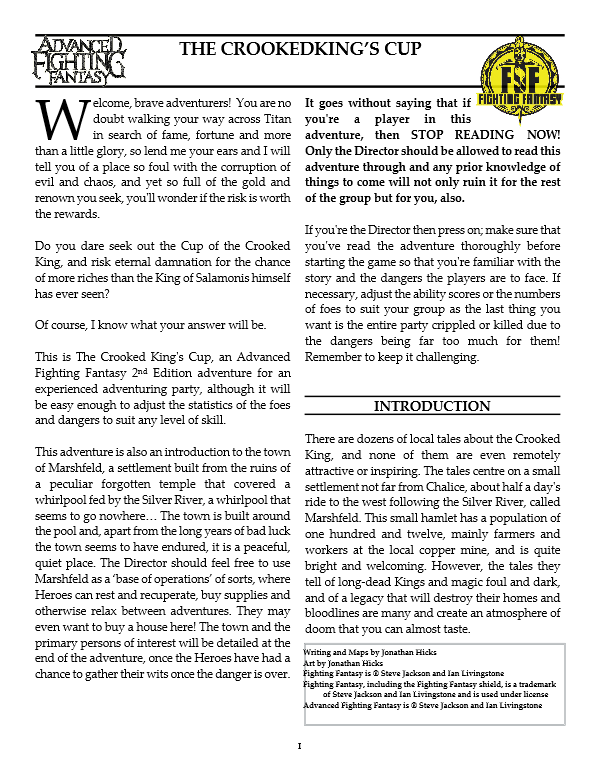 Forgotten Realms gets a lot of attention in here only as examples, but it does give the impression that the game is rooted firmly in the campaign settings created for it. I don’t have much of a problem with this as I run D&D campaigns in D&D settings, but if you’re looking to use this for a setting such as Middle-Earth or for a world of your own design then it’ll need some tweaking. Such is the nature of the hobby but if anyone at Wizards of the Coast is listening then please save me some work and bring back the Birthright setting! - You have a selection of skills, but not too overbearing or detailed. - The Saving Throw is now Ability based, so you have to roll a D20 plus your Ability modifier against a DC. Simple. - There’s a cool Advantage/Disadvantage rule; if you have an Advantage then you roll two D20s and keep the higher score, and it’s the lower score for having the Disadvantage. - Inspiration rewards players for roleplaying their character’s personality, traits and flaws well and gives a bonus to a chosen roll. - There’s also a neat Background section in which you can choose a background, such as Charlatan or an Entertainer, and you a roll on random tables to build a suggested history and personality. It’s optional, but it does create some interesting characters that some gamers might find it a challenge to roleplay out. 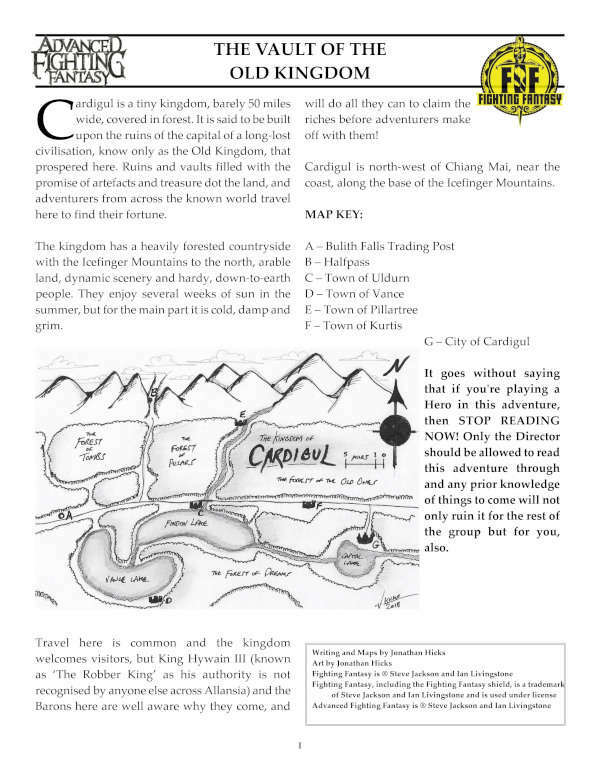 - The Magic system is easy and is a simple case of using spell slots, which a rest and research replenishes, and the spells are as varied and as detailed as ever, giving spellslingers plenty of options. - Combat is hauled right back and covers movement, actions and attacks of all kinds. It’s a short section of the book and the DMs Guide will no doubt expand on this, but it’s straightforward and easy to manage, and what I saw as the complications of 4th Edition are gone. In all, the rules have been lightened and simplified and the additional rules add options and a bit more dynamism but no extra complication. I like the rules. A lot. In fact, I think that these are the best D&D edition rules that are available as they take the game, trim the fat and make it much more playable. You still have your crunch but the rules feel modular so you can drop certain sections if you want. For example, I probably won’t use the Feats or the Inspiration rules. Will it affect the game? Not at all. Unless the players make a fuss of not having the option it won’t disrupt the rules at all. Would it unbalance them? Maybe. But I’ve never cared about game balance in any game I’ve ever played so that’s not an issue for me. These rules make the game as simple or as complicated as you want it to be. 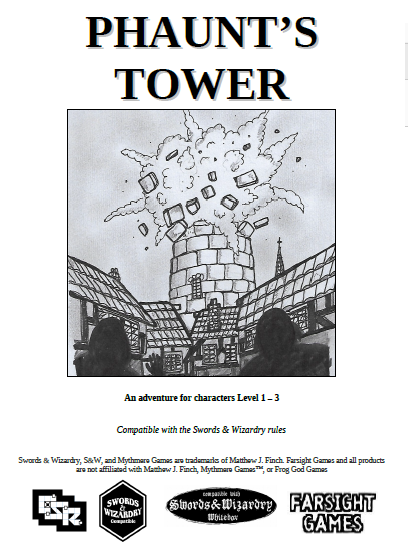 The book is almost a full roleplaying game in itself. 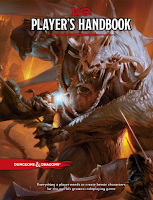 You’ll still need the DMs Guide and the Monster Manual – that’s a dead cert if you’re new to the hobby - but there are some beasties in the back you can use as templates and get a few games out of this book to wet your appetite for the following books. There’s nothing stopping you from using an old 3.0 or 3.5 Monster Manual if you want to do some low-level games, but the official 5th Edition manuals will no doubt be your best choice. With brief appendices including Conditions (such as Grappling and Paralyzed), Gods (including the pantheons of Forgotten Realms, Greyhawk, Dragonlance and Eberron, as well as real-world pantheons), the Planes of Existence, Creature stats, Inspirational Reading and an Index, the book has everything a player will need to get into a D&D game. As I said before seasoned gamers will be able to use this and get playing straight away but newcomers to the hobby will be better off waiting for the other two core books to really get into the game. My thoughts about the cover presentation aside, D&D 5th Edition is a solid, well thought out game that I think really delivers. 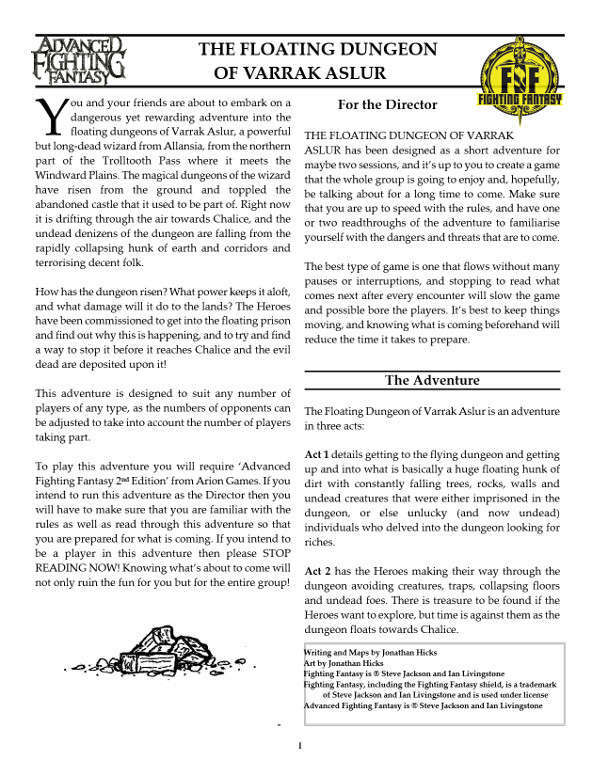 There were ideals that this edition would help to unite all editions and that D&D players will finally have a unified set of rules they can all enjoy and share. I don’t see much of that, truth be told, but I do see an attempt to strip away the complication and an attempt to return to a more streamlined simpler game system and a rulebook that promotes characterisation and roleplaying. This makes it an attractive game to me, and the thought that I can simply drop entire sections of the rules to help simplify my experience even further really appeals. There’s nothing stopping me from running what would tantamount to a Basic D&D game. This was no doubt true of other editions, but this is divided up in such a way that I can completely ignore certain sections and not have to worry too much about the effect that the exclusion will have on the rest of the game, and maybe even re-introduce those options later on in the campaign. Does it make me look back on the days of old when my BECMI days were King, and does it capture that atmosphere and sense of adventure and fun? No, not really. I think it’s impossible to do that and any attempt on mine or the game’s part to try and recapture those heady days of D&Ds popularity would be a little foolish. I don’t think this game has really tried that and it stands on it’s own merits without cashing in on the nostalgia factor. It was nice to read those old Forgotten Realms and Dragonlance novel snippets but that’s as far as it went, I think, and the game really has been designed for the here and now. Would I recommend it to D&D gamers of other editions? That’s the real trick, isn’t it? I’d certainly recommend them to have a look, but the editions are pretty much entrenched, now, and gamers play the editions they love. Their preferred versions not going anywhere and the nature of an ongoing roleplaying campaign means that groups do not have to rely on newer or older editions to enjoy their chosen version. That’s a given. 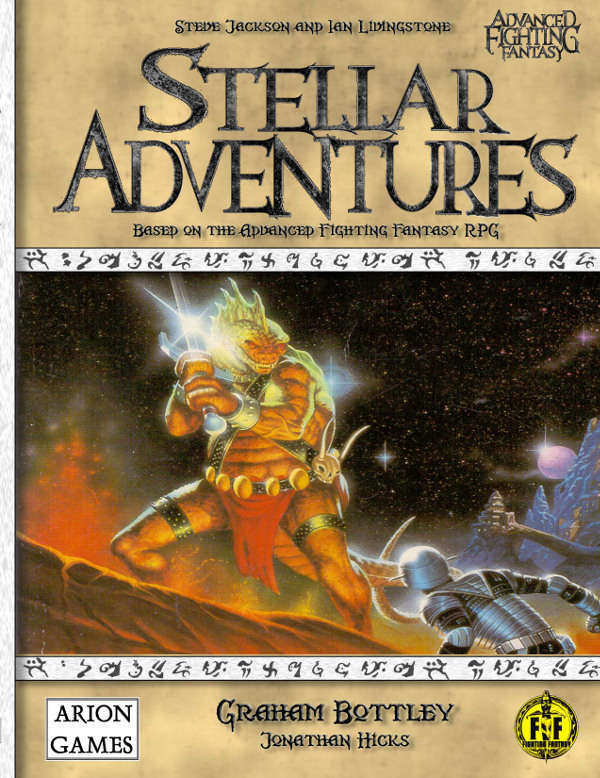 I’d certainly recommend it to general D&D fans that have followed the game over the years and dabble in all editions. This just might be the edition you stick with permanently. A couple of years ago I wasn’t enamoured by the thought of a new D&D edition but after reading this book I’m convinced that the flagship game is going in the right direction. 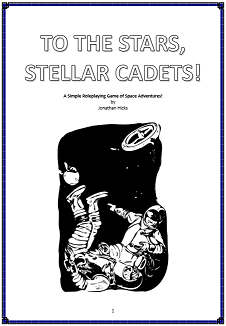 Some decent support with adventures and sourcebooks are a must, and modular rules that do not have to be used in existing campaigns would be welcome so that games do not have to be modified as new material comes out, which would ultimately make the game bloated. If D&D sticks along this track then I see good things for the future of the 5th Edition of the game. One Line Summary: A one-stop shop for all your post-apocalyptic gaming needs. The horrors of post apocalypse survival are nothing new to the seasoned gamer to the extent that rolling up your sleeves before downing your anti-rad pills and donning a full face gas mask is as familiar as a day at the office to many roleplayers. So do you really need more of this heavily mined genre? Because there are as many different visions of the apocalypse as there are eyes to see it. From meteor strike to nuclear war to zombie plague outbreak to simple and generic “it happened”, there have been more stabs at the post-apocalyptic yarn than… I don’t know, some faintly disturbing simile involving stabbing. But LOADS, is my point. And any fan worthy of the name has imagined their own involvement in such dire times, each with their own take on exactly what to do when there’s more dust fields than oceans and your neighbour pops round to borrow a cup of sugar and eat your brains. The creators of EarthAD 2 are not only aware of this need to legitimately take down your neighbours and co-workers, they share your passion and have allowed themselves to be influenced by just about every version of the apocalypse committed to film, radio, comic book, video game and IPCC report. The result? A rule book designed to help you play out whatever personal dreams of end of the world mayhem you’ve been harbouring ever since you first heard the phrase ‘nuclear winter’. EarthAD 2 is a generic rules system so rather than being tied into one creator’s take on this oh-so popular subject you can now mix and match or simply play it old school vanilla but in a setting of your own devising. So far, so laudable. But how have they done? Character creation is not complicated and once you’ve rolled up one PC you’ll find that you can whizz through it fairly quickly should you need to again. There’s a stock character list so comprehensive (from pure-strain human to evolved aquatic mutants, via cyborgs and space creatures) that I’m more annoyed at being spoiled for choice than anything else. The skills list is similarly thorough and has aimed at covering every conceivable type of activity/ability you can think of in your efforts to survive the cataclysm. In one respect this is a good thing since you shouldn’t ever have to ask your GM “what should I roll to do XYZ?” and get a reply telling you to just roll whatever you think seems to be the closest stat. On the downside, however, the bewildering array lends itself more to rule-junkies than the gamers who rank simplicity above all else, a demographic which includes me. The rules for using vehicles are simple and easy to use and, again, there is another list of ‘gimmicks’ (basically a skills and modifications list) for vehicles which gamers that like to personalise their machines will appreciate. 'In order to determine if a task succeeds, first compute the skill total, which is equal to the sum of the relevant ability and skill ratings. Then roll two six-sided dice and calculate their sum. This gives us a dice total. A character accomplishes a routine task when his dice total is less than or equal to his skill total. Also, snake eyes (double ones) is an automatic success and boxcars (double sixes) is an automatic failure. Simple. So simple I copied and pasted it right out of the PDF rather than try to find a way to paraphrase, which would have probably sounded more complicated. Why make life harder? Straightforward, simple and easy to apply. There are also handy charts in the rules to help GMs make sure they’re using the right difficulty ratings and skills. My gripe, at this stage, is not so much that the rules are complicated, it’s that there are so many things that have been taken into consideration that it can be a little daunting for first time GMs and those who are new to this system. But then, if you want a comprehensive guide to the end of the world, that’s what you can expect. Just don’t be surprised if your first few gaming sessions run with several breaks to check the rules. But that’s all for the rules! The meat and bones of this book is examples of post apocalypse and how to game in them. Yes this book is designed for people to be able to run an end of the world scenario right off the top of their head while not worrying about how to make it work but it doesn’t fail to give you plenty to work with too. There is copious material here for locations, environments, hazards, creatures and anything else you’re going to need to throw at the PCs. Likewise there are some sample adventures to get you on your feet and a raft of pre-generated characters for those, like me, who sometimes prefer to let someone else do all the work while you have all the fun. In conclusion this rulebook is a ‘does what it says on the tin’ affair. Need something to support your game set after the zombies have launched the nukes at all the dinosaurs which were battling aliens that arrived on a meteor? EarthAD 2 makes this distinct possibility a gaming reality. There is a fair amount of minutia to get bogged down in so I can’t say that it’s the easiest thing to take on board quickly but several sessions should see gamers rattling along nicely. Now, I’m off to club a super mutant with the claw from a mutated crab. And maybe play a game. So - got the new D&D 5th Edition game and the Hoard of the Dragon Queen adventure for review. Thanks, WotC. I've done my preliminary read through and I'm going to be honest - I like it. I like the feel and the atmosphere, the choice of art, and I like the changes to the rules. I'm still not hot on the presentation - the covers don't shout 'PLAY ME!' and the design isn't great - but the game feels solid and playable. What's more, the character creation doesn't feel like a slog, like the previous two editions did. I'll have to play it to get a proper feel, but I really like what I've read up to yet.